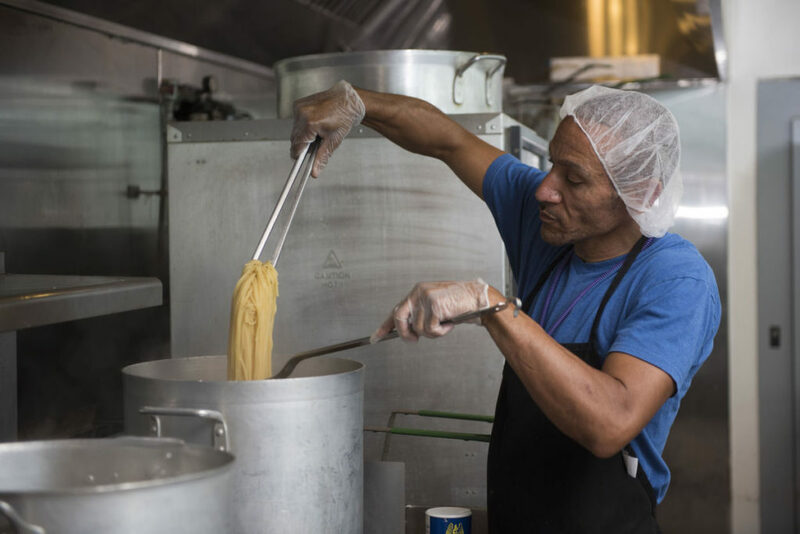 Erick Payton was once a client at The Union Mission, now he’s the food services manager. The Union Mission provided food, clothes, and lodging to people who needed it, and shared the gospel in the process, he said. The organization stayed in a “blighted” part of Norfolk until it improved economically, and then would relocate, he said. But by the 1950s, the organization had almost shut its doors. It lost its “vision,” Gray said – and bills hadn’t been paid. Then the Rev. Ted Bashford, a Portsmouth native, took over. He restored the organization and set up its present staff to turn the mission into what it is today, Gray said. “A 21st century version of that original vision, adapting to all that we’re seeing in our culture, in humanity.” That includes a permanent home. The Union Mission also has day centers, where “you can do your laundry, you can take a shower, you can have a meal,” said Linda Jones, the organization’s Public Relations Director. The people who use the facilities have changed over time. “In 1892, they were older males, all white, had a family structure, a basic level of education, a skill of some kind and perhaps an alcohol problem,” Gray said. Today, the clients are diverse: “people with eighth grade educations and people with college degrees,” Jones said. When you walk across the campus, “you won’t know who’s staff and who’s homeless.” The problems people face have changed, too. “Homelessness is a symptom of a whole bunch of other things,” Gray said. The people he serves deal with substance abuse, mental and medical illness, and barriers to employment, he said.